North Richmond Joint Venture engaged Kelleher Nightingale Consulting to undertake an archaeological survey excavation for Aboriginal heritage at Redbank Creek. Fieldwork was carried out in late 2016 by archaeologists and field representatives from various Aboriginal community stakeholder groups. Native aboriginals in the Richmond area are the Darug peoples Boorooberongal clan. The Hawkesbury and Nepean area was one of the first areas of the Sydney region explored by European colonists, meaning it was also the location of some of the earliest recorded interactions with local aboriginal inhabitants. Historical documents support claims that aboriginal people in the Richmond and Hawkesbury area had settled around the Redbank Creek area. In 1795 a battle fought between the Darug people of the Richmond and Hawkesbury area and the New South Wales Corps which included several armed settlers was recorded to have taken place, it is now commonly known as ‘The Battle of Richmond Hill’. This event has been widely considered to be the first recorded battle between Aboriginals and settlers. A memorial garden commemorating the Darug people of the Richmond and Hawkesbury area in New South Wales was established within the grounds of the St John of God complex on Grose Vale Road to commemorate the battle, where Darug people fought to defend their land from invasion. Based on the results of earlier test excavations along Redbank Creek, further investigation was required at two significant areas within the Redbank estate. The aim of this exercise was to recover a sample of archaeological deposits before civil construction in these areas commences. 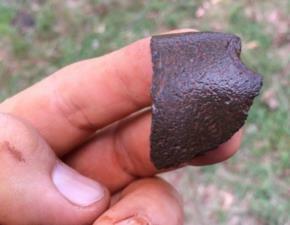 Thousands of stone artefacts have been recovered and cultural features identified. Further evidence supporting aboriginal settlement around the North Richmond area can be located on the banks of Redbank Creek where there are still grinding grooves visible in the rocks today. These grooves are spread over a 20 metre section of Redbank Creek. This collection of grooves is distinctive because an artificial channel has been cut into the sandstone between two rock pools. Aboriginal people created such channels to manage the water flow required for axe grinding even in dry periods. Artifacts found at survey sites during the archaeological survey reflect a wide range of site activities. Artefacts included cores, larger flake tools, some backed artefacts, as well as unifacially flaked pebbles and other modified pebble and cobble tools with pecking or grinding such as hammers, anvils and grindstones. All the various groups involved in the survey were delighted with the findings. A sample of layered deposits taken from the soil in the area could potentially assist putting found artifacts into a chronological sequence, further validating a timeline related with lands usage. As construction of the Redbank estate progresses you will find sensitive aboriginal areas being retained as open space and parkland, like the area next to Peel Park which will be completely accessible to all. Signage will be erected along walking and bike tracks highlighting the sites history and identify significant finds in the area. We currently have 71 homes under construction and 6 homes moved into. Once residents are satisfied that your home and landscaping is complete, and that the Design & Landscaping requirements have been met, you may apply for the rebate through our Design Review team at designreview@nrjv.com.au. A rebate form can be found on the back page of the Design Guidelines booklet located on the ‘Building at Redbank' tab on the website. Once this form is lodged with our design review team. The exterior of your home and landscaping will be inspected by our team. Once your property meets all requirements, your rebate will be returned to you. This process generally takes 4 weeks to complete. Land and Property Information (LPI) are currently reviewing the lodged Plan of Subdivision (DP & s88b) of our Mountain View precinct. We anticipate registration will take place during the next fortnight. Once lot registration is confirmed by LPI, all purchasers will be notified by our legal representative, Thompson Geer. Our office will also send an email to purchasers advising this news. Settlement will be scheduled fourteen (14) days from notification to your legal representative. Additional work to enable release of stage 2 within Mountain are complete and our team are currently waiting for Sydney Water to release the section 73-certificate required for lot registration. 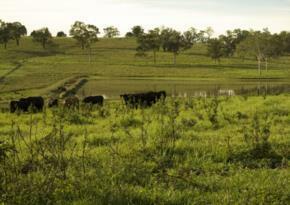 Upon release of the section 73-certificate, Hawkesbury City Council will review our subdivision application. Once this is approved by Coucil we will be able to lodge the Plan of Subdivision (DP & s88B) with Land and Property Information for their review and approval of registration of lots. Purchasers within Mountain Views stage 2 release will be sent an email advising when the submission of the Plan of Subdivision with LPI has occurred. As detailed in our last newsletter, our team continues to work with Sydney Water to find a solution to the potential high pressure water issue which would be experienced should we connect into the existing Kurrajong / Kurmond water-main for our Stage 3 Release. There is quite a lot of work involved in this process and purchasers within the stage 3 release will be advised of progress in due course. Preliminary site preparation works are continuing, with dam decommissioning well underway. The Belmont ‘Meet your Neighbour’s' event is being hosted onsite this evening. We are looking forward to seeing all our purchasers and providing you this unique opportunity to meet your soon to be neighbours and to get the latest update on works. JK Williams have almost completed preparation of lots to assist minimising the time to start building, following the additional delay in registration. Land and Property Information are currently reviewing the lodged Plan of Subdivision (DP & s88b). We anticipate registration will take place during the next fortnight. Once lot registration is confirmed by LPI, all purchasers will be notified by our legal representative, Thompson Geer. We will also send an email to purchasers advising this news. Settlement will be scheduled fourteen (14) days from notification to your legal representative. If any purchasers within The Gallery have any questions relating to the Building Contract with McDonald Jones Homes, please contact Elif Kaplan via email at ekaplan@mjhmulti.com.au or on 02 8808 7467. The Development Application for Yeomans was approved on Thursday, 22 December 2016. Stage 4 contract preparation is underway. Purchasers with reservation agreements will be notified as soon as they are available. Tom's photo of the week are of 2 news residents on the dam next to Peel Park. 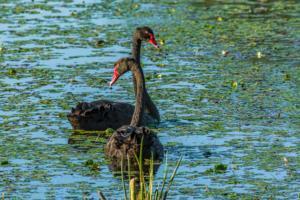 During the last fortnight, 2 beautiful black swans have taken up residency in the Peel Park dam. Hopefully they are enjoying their new surrounds and are looking to make their stay more permanent.